op amps, inverting op amp schematics, non inverting circuit diagrams, open source freeware images of popular operational amplifier circuit schematics. Circuit schematics for non inverting operational amplifier or non-inverting op amp circuit diagram. 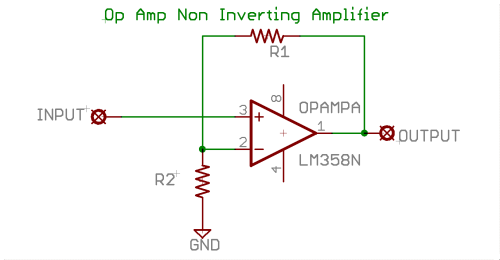 Open source image of op amp circuitry of a non inverting op amp schematic diagram download free. LM 358M op amp circuit diagram. Schematics for a unity gain op amp circuit or unity gain operational amplifier circuit schematics. Open source image of op amp with unity gain circuit. 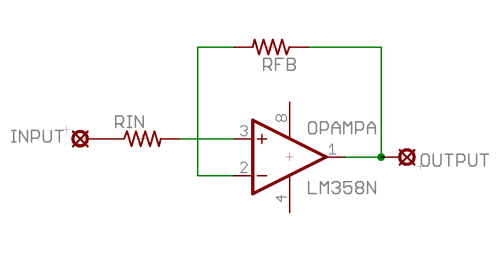 Free download LM358M op amp circuit schematics of operational amplifier.